The Maltese ‘owls’ in St Peter’s Square, Rome. 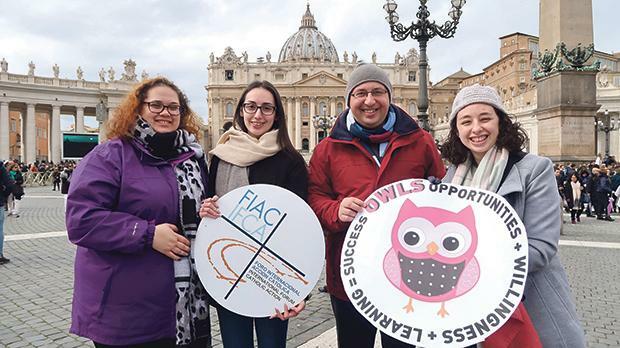 Twelve people who work in the youth sector in in Malta, Italy and Romania recently took part in a week-long training programme in Rome as part of the Opportunities + Willingness + Learning = Success (Owls) project. The project, which is financed by Erasmusplus programme, is aimed at fostering collaboration and unity between Catholic Action in the three countries. The project will help the particpants share experiences, challenges and successes that young people in their respective countries face, enabling them to help and learn from each other. While the participants are committed in their local groups and communities, sometimes they lack a strong methodological background to sustain their work. Learning about positive youth development can enable them understand whether they are on the right path, and at the same time identify aspects that can improve in the service they provide locally. During the training programme the upcoming Synod on Youth was one of the main topics discussed. One of the participants, Fr Tony Drazza, said “the synod asks us to be fully engaged in the discussion on youth, faith and discernment. How can we promote dialogue between the Church and young people? What are the main topics that are at the centre of the discussion among young people and that Church should tackle? The participants also visited a monastery in Vitorchiano, and visited Viterbo, where where Mario Fani, one of the founders of the Catholic Action, lived. The next meeting will again be held in Rome and will bring together 15 young people from each project partner. During 2018 and 2019 there will be another three such exchanges.